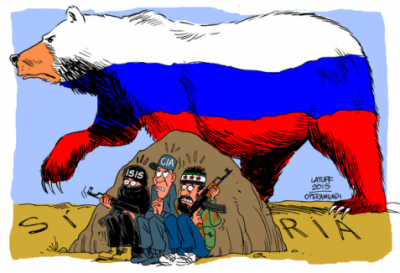 As the Project for the New American Century is further knocked off course by Russia’s military presence in Syria, hackles are up and the dogs of war are once again straining at their leashes; with the by now infamous ‘chemical weapons’ false flag scenario. It is particularly noticeable, living in Poland, how the vendetta against Putin is a NATO, Israel, UK, France, USA construct (hidden hand). The demonization process reached its zenith recently – and an interview I had given for alternative Polish media refuting the notion that Russia was about to invade Poland, was hacked from the site and never seen again. Instead, US Patriot missiles sites are established in ever increasing number of locations in Poland, as 30,000 US led NATO troops periodically carry out highly provocative ‘war games’ on Russia’s Western Border. Many Poles are under the gravely mistaken belief that these troops and armaments are there to protect Poland from invasion from the East. The ‘Russian Bear’ is being poked remorselessly, and it is only Putin’s cool headed statesmanship, plus the diplomatic skills of Lavrov’ and others, that is preventing all-out war from braking out at any moment. The role of alternative sites, like Global Research, in exploring and conveying the actual reality/truth – has never been more important than now.